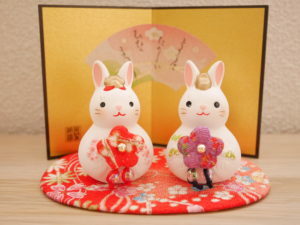 The day of March 3rd is called “Hina-matsuri” in Japan. It is a Japanese traditional festival for the girls. People celebrate and wish for their healthy growth and happiness. And then, they eat the traditional feasts with their family to celebrate it. The famous ones are like, “Sushi”, “Cram Soup”, “Shiro-zake”, “Hina- Arare” and so on. Do you know that there are many types of sushi in Japan? I’m going to introduce one of the sushi recipe. 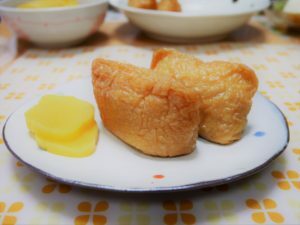 It’s called “Inari-zushi” and you can eat them casually at home. Cut the abura-age (deep-fried tofu) in halves and open each pocket by hand. Boil (1) for about one minute to remove excess oil. Drain the abura- age using a strainer. Put the water, seasonings (☆) and abura-age into a pot. Then, simmer them until almost all broth are reduced. Cool it down after turning off the heat. Mix the seasonings (★). Put the freshly cooked hot rice into the bowl. Fold the seasonings and white sesame seeds into the rice by wooden spatula. Divide (4) into 16 pieces and shape it into cylinder gently. Squeeze the abura-age (3) lightly. Open its pocket and put the rice in it. Reshape it and serve on the plate. 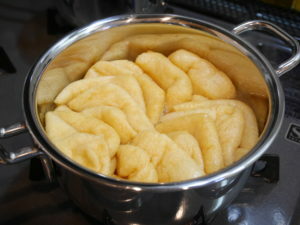 ・When you do the step 4, don’t mix them too much or they will be sticky and become hard. 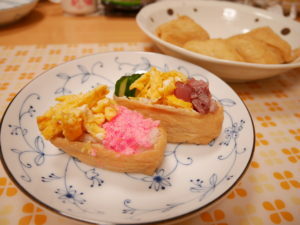 ・Place a inari-zushi upside down and decorate with some toppings like cucumbers, sashimi, eggs…. It looks gorgeous and more fun!